A major report published this week (27/11/2018) urges a radical rethink in order to close the gap on cancer survival between England and comparable countries. The key recommendations set out were a focus on early diagnosis and investment in diagnostics. The report, published by The Health Foundation in collaboration with Professor Sir Mike Richards (former national cancer director), assesses the progress on cancer care in England over almost two decades. In 2000 Richards introduced England’s first cancer plan with the promise that by 2010 “our five-year survival rates for cancer will compare with the best in Europe”. This has not been met. The report found that England has made progress on reducing mortality (improving the chance of survival) and on improving the patient experience of cancer care. However, the gap in survival compared with other countries has not been closed. The report uses the recent CONCORD 3 study as evidence which shows the UK as a whole lagging behind Australia, Denmark, Norway and Sweden in six common cancers. It came last in all but prostate cancer, where it was second to last after Denmark. The report fails to mention pancreatic cancer – which has the worst 5-year survival rate of all 22 commons cancers and has barely changed for almost 50 years. The same CONCORD 3 study shows that pancreatic cancer comes 47th out of the 56 countries surveyed in terms of 5-year survival. Why are we so behind and what are the recommendations? The report says that the NHS need to invest significantly in diagnostic equipment and workforce. Although there has been some investment in equipment to treat cancer, the UK has fallen far behind countries in the availability of diagnostic equipment ranking almost last for CT and MRI scanners – both of which are used to diagnose pancreatic cancer. What’s more it is suggested that the ‘gate-keeping’ role of GPs in the UK is a contributing factor to late diagnosis. This refers to GPs predominantly having responsibility for deciding who will be referred to hospital and providing patients with access to diagnostics and specialist care. This role can slow down patients access to diagnostics and ultimately treatment. It may also stop patients visiting their GP for advice and GPs from investigating or referring patients. The report identifies early diagnosis as critical to improving a person’s chance of survival, as early-stage cancer is more responsive to treatment than late-stage cancer. It shows that in breast cancer, 97.5% of women referred urgently by their GP between 2011 and 2015 survived 1 year, but only 57%.2% of those who arrived as an emergency in hospital did so. The patients who arrived as an emergency had later stage cancer which is harder to treat. In comparison, we know from the latest NCIN Routes to Diagnosis study that when pancreatic cancer patients are referred by a GP, their 1-year survival rate is 31% versus just 12% when they present as an emergency in A&E. Worryingly, almost half of pancreatic cancer patients are in fact diagnosed in A&E. It is also recommended that there will need to be more progress in helping the public understand the symptoms associated with cancer, so they can seek help sooner. Early diagnosis and helping the public recognise the signs and symptoms of pancreatic cancer is a key focus for Pancreatic Cancer Action. There is no screening test for pancreatic cancer and currently the majority of patients are diagnosed too late for effective treatment and are given only 2-6 months to live. What’s more we recently carried out a survey which shows us that 95% of the UK don’t know a lot about the symptoms of pancreatic cancer. It is crucial that people are aware of the signs and symptoms and are not afraid or embarrassed to visit their GP or pharmacist to seek advice. At Pancreatic Cancer Action we welcome these recommendations, it is however disappointing that pancreatic cancer is not mentioned at all in this report -despite the increasingly high rates of the disease in the UK and a recent study showing that deaths will be 25% higher than breast cancer in the EU by 2025. 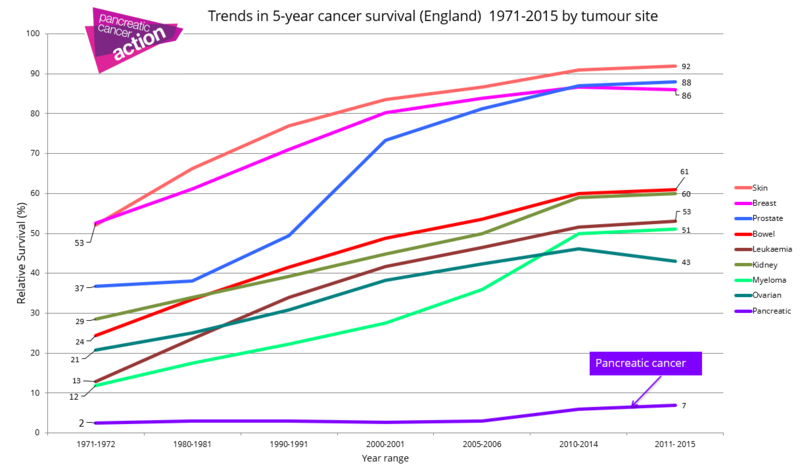 As well as mortality rates for pancreatic cancer increasing, the disease has been chronically underfunded for decades and whilst survival rates for most other cancers have improved, pancreatic cancer survival statistics has stayed the same for almost 50 years (see graph below). This is a disease that urgently needs to be addressed. To find out what are are doing to make a difference click here, to help us take action, click here.